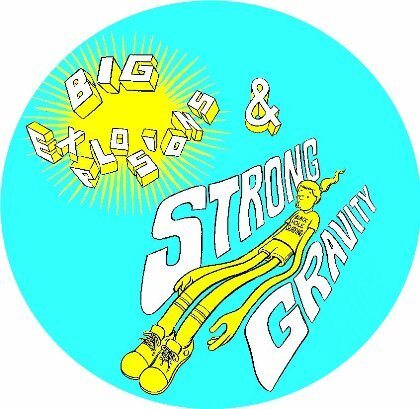 Welcome to the Big Explosions and Strong Gravity website. This is an event for middle-school teens (around ages 11-13, or Cadette Girl Scouts) that was specifically developed with Girl Scouts in mind. Please follow the links in the menu to the left to see pictures from the events or to read descriptions of the activities. What is Big Explosions and Strong Gravity? 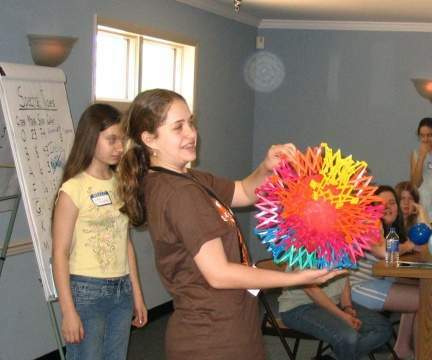 Big Explosions and Strong Gravity is an event where girls meet real scientists and join them for a day of exploration into supernovae and black holes. 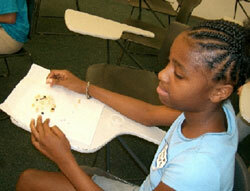 They do hands-on activities to learn about exciting ideas that will help them understand these fascinating phenomena. In the morning we explore elements in the universe and how light is broken up into all the colors of the rainbow, as well as how astronomers use this to tell what distant objects are made of. These activities provide the basis for our focus topics: black holes and supernovae, which we explore after a lunch filled with fun activities. This event has now been run on five occasions (July 2004, June 2005, November 2006, April 2008, and April 2010) in the Girl Scouts of Central Maryland council. In that time, the event has been hosted at both Johns Hopkins University, and at a Girl Scout facility called Camp Ilchester. Over the years, many professors, physics and astronomy grad students, professional scientists and engineers, and Girl Scout volunteers have been involved in putting on these day-long events. This included astronomers from JHU, STScI, University of Maryland, CUA, and Goddard Space Flight Center. 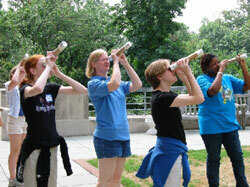 In the summer of 2010, we ran a training at Goddard Space Flight Center which included representatives from 18 different Girl Scout councils around the country, who will bring the program to their own councils, as well as nearby councils that are interested. While we hope the event continues to run in the Central Maryland council, we want this curriculum to be available everywhere. We are exploring options to run other trainings in the future. In the meantime, the manual and other resources are freely available on this website to anybody who is interested. We will also be happy to help connect Girl Scout Councils with trainers in nearby councils who can help you with the specifics of the program. Beyond this event, what else can interested girls do? For girls who want to pursue an interest in space science beyond these one-day events, we have started a girl-driven teen Girl Scout club called "ACE of Space". Girls interested in pursuing this opportunity should contact the Girl Scouts of Central Maryland council. These activities are made possible through NASA Education and Public Outreach (E/PO) funding. The first two years were provided by Chandra X-ray Center E/PO grants (during Cycles 5&6, PI: Hornschemeier). Continued support has been provided by a NASA ROSES E/PO supplemental grant [ROSES EPO-07-768, supplementary ADP grants 06-ADP06-27 (Hornschemeier), 06-ADP06-0065 (Loewenstein) and 06-ADP06-36 (Strohmayer)]. The Constellation-X Project has also provided procurement funds in 2008.